The National Football League (NFL) is the United States’ most-watched professional sports league. It has entertained Americans for generations. In fact, some might say that American football culture has become so institutionalized that it constitutes an inseparable part of the American way of life. But, in light of the tumultuous political climate, this popular institution has found itself neck-deep in a political rabbit’s hole, dating back centuries, which begs the question: who holds power, the state or the individual? In August 2016, the San Francisco 49ers hosted the Green Bay Packers in a regulation game during the league’s preseason. In line with tradition, the game opened with the national anthem. 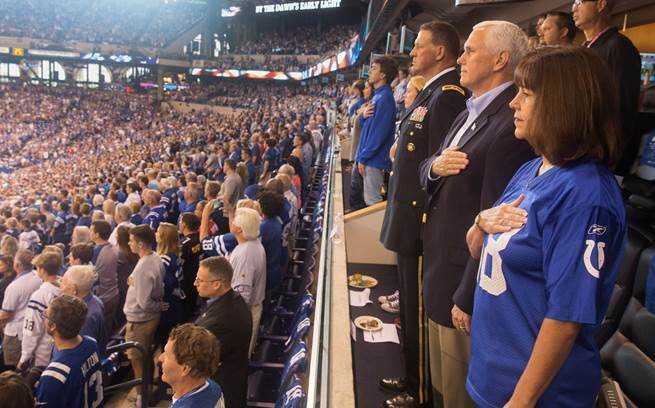 In the stands and on the field, attendees and athletes alike stood, but not Colin Kaepernick, the 49er’s quarterback. He instead took his seat on the bench. I was not going to stand up to show pride in a flag for a country that oppresses black people and people of color. Over the past few years, the United States has seen a dramatic rise in local law enforcement agencies using excessive force against African-Americans, Latinos, and other People of Color. Agencies have illegally detained individuals; used force to pin them down; and disproportionately discharged firearms, sometimes fatally, against dark-skinned Americans. But to what end? Keeping aside the narratives put forth by various news outlets, the question boils down to a universal phenomenon: power. Activists often use popular team sports as springboards for movements because they know people are watching. The NFL and the National Basketball Association are two major sports leagues in the US in which a majority of players come from minority racial and ethnic communities. These leagues are likely the only national institutions which have given individuals from minority communities a new identity that successfully breaks pre-existing racial stereotypes. National leagues like the NFL represent a collective effort for the benefit of the whole community, and true to its role as an integral social institution, it can be a setting to defend civil rights. When the state fails to protect the rights of its citizens, the citizens must defend their own, defying the wishes of the state if necessary. 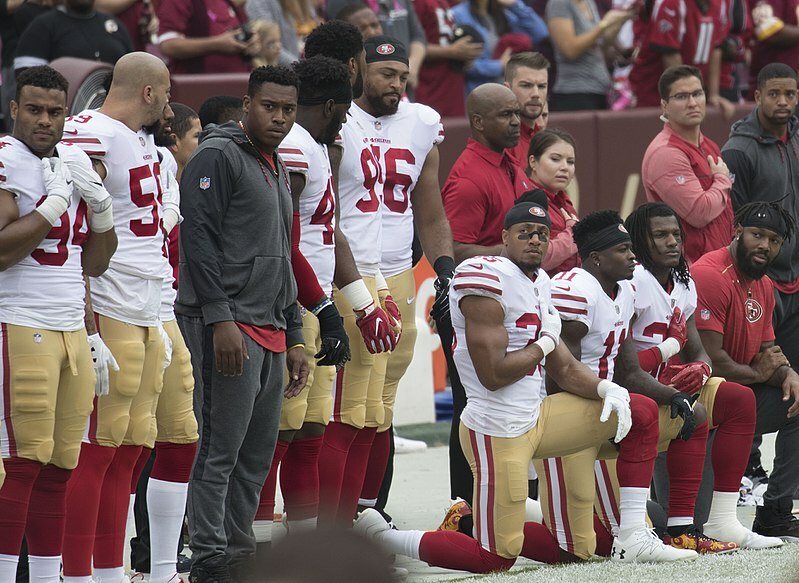 If the individual chooses the NFL as a place to protest gross violations of citizens’ rights, it is because minority communities acknowledge the importance of the forum and the power it yields to bringing about positive change in the country. Modern technology has only served to heighten the current controversy and underscore the inherent conflict between the state and individual. The information age has ushered in a new era of state-individual relations in which political theorists focus their efforts on examining new dimensions and definitions of power. The average citizen’s ability to get in touch with his elected representatives (or unelected representatives for that matter) has changed with the development of the digital web. Internet usage has cut down the time, resources, and number of people involved in the process of communication. Rational predictions, made at the start of the information age, envisioned the Internet to be a tool with which the general public could collectively express joy, anger, or discontent toward the state. It was destined to be a peaceful, democratic means to demand justice and equity. Notwithstanding the myriad uses of the Internet, the net-sum benefit of the worldwide web has not necessarily improved state-individual relations. President Trump’s tweet portrayed Senator McCain as a hypocrite, ignoring the legitimate concerns that the lawmaker had with the current bill. But with his tweet, President Trump’s changed the discourse of the entire issue, deflecting criticism toward his opponent. The state does this in an attempt to tackle topics ranging from tax cuts to exorbitantly expensive wars. While certain states try to narrow the gap between voters and government by placing social injustices on the political agenda, most demonstrate a blatant disregard for addressing the white elephant in the room: the state and the individual have a fragile relationship which has to be polished regularly. In fact, the stagnating relationship between the state and the individual is not a phenomenon that is unique to the US, but one that occurs in democracies around the globe. We find ourselves at the mercy of a beautifully crafted agenda, coordinated as much in bureaucratic offices today as online, one which is designed to rake up baseless fears. The central problem of the state-individual dilemma is further complicated by the philosophy of the state itself, in which individuals willingly surrender their rights in exchange for protection against forces that they cannot overcome individually, such as a foreign invasion or a civil war, by way of a “social contract.” The British philosopher Thomas Hobbes famously coined this concept in the 17th century, and it has informed much of the debate surrounding the development of the modern nation-state since then. A modern state feels obligated to utilize its resources—capital, labor, and materials—in an attempt to fulfill its end of the contract. Throughout the course of the last three centuries, however, it seems that the theory hasn’t evolved. In fact, the single most irritable point of contention that remains between the state and the individual is the inability to clearly delineate what constitutes the rights of individuals and states. It is no mystery as to how the state-individual relationship functions. In fact, it’s deceptively simple: if a state exercises its obligations beyond a point, it will find the precedence to do so again, unless there is a strong response from a collective of individuals. Colin Kaepernick chose to protest because remaining silent in the face of systemic abuse would have justified the actions of the state. State-individual relations are influenced by a constant checks-and-balances system which involves either party correcting the other. If the state finds itself justified in using force to achieve its goals, then the individual must also find it justifiable to protest in a peaceful manner. The incident with Colin Kaepernick, and similar recent developments in the NFL demonstrate the failure of the state to protect the rights of individuals by attempting to control the narrative of what should be viewed as “good” and “bad”, using social media to do so. But a collective of individuals can resist this. Today, well-informed young people wish to vote at an earlier age; protests can reach a wider audience through social media; and people are more inclined to debate the future of their country on public online forums. Grassroots political movements, like the Tea Party, have grown exponentially because like-minded individuals can now coordinate their efforts more easily through the Internet. Jaikishan Agarwal is a contributing author for The Paris Globalist and a graduate student at the Paris School of International Affairs.